The visualization shows birthplaces in blue and death spots in red of notable people including artists and politicians. It offers a glimpse into the large-scale geographical patterns that shape cultural evolution in North America. An international team of researchers, including an art historian and a handful of physicists, have crunched three giant databases that record the births and deaths of notable people to map the geographical creep of culture over two millennia. The study, published Thursday in the journal Science, presents an unusual way of tracing the arc of history. In lieu of the more typical approach of digging deep into a distinguished individual’s life or a particular time period, the researchers instead marked the discrete beginning and ends of thousands of notable lives, without regard for who they were or in what domain they had distinguished themselves. The people had been included in Freebase, a crowdsourced database of people and two databases of artists. Mapping and analyzing the many data points left behind by artists, politicians, scientists, and other prominent people will, they hope, point to cultural and intellectual capitals and provide quantitative evidence that will both support historical interpretation and pose new questions. In many ways, the findings will be unsurprising, confirming things we might have guessed. Places such as Hollywood and Los Angeles tend to be “death attractors,” where the notable deaths outnumber the notable births. The Boston area is more of a cradle than a grave; it tends to produce more notable people than ones who die here. Maximilian Schich, associate professor of arts and technology at the University of Texas at Dallas, began the work when he was a post-doctoral researcher in Boston and notes that he may even have contributed to the city’s pattern of being a birthplace for notable people -- he started his family when he lived in the area, then moved to Texas when he began his own independent research career. Digging into any particular location, however, could reveal how patterns change over time or provide a window into what cities are cultural magnets in other countries. In the Boston area, there are places, such as Jamaica Plain, Brookline, and Newton, that tend to have more notable deaths than births as well as places such as Allston, Malden, East Boston, or Dorchester where more notable people were born than died. “On the local level, you can see this intuitive reflection of the relative attractiveness of places,” Schich said. The work had somewhat unconventional beginnings. For years, Schich worked as an art historian in a Northeastern laboratory that was best known for its work in a totally different area, discerning human migration patterns by analyzing cellphone data. What interested the physicists who were trying to understand human migration about his project was the idea that they could look to see what those migration patterns looked like over a lifetime and over centuries. What drew Schich to hang out with a bunch of physicists was a desire to bring the statistical tools of the quantitative sciences to a field in which scholars usually read hundreds of books and specialized in distinct time periods. Schich and colleagues used three databases that listed the birth and death places of notable people -- one that listed all-around prominent people and two that focused on artists. 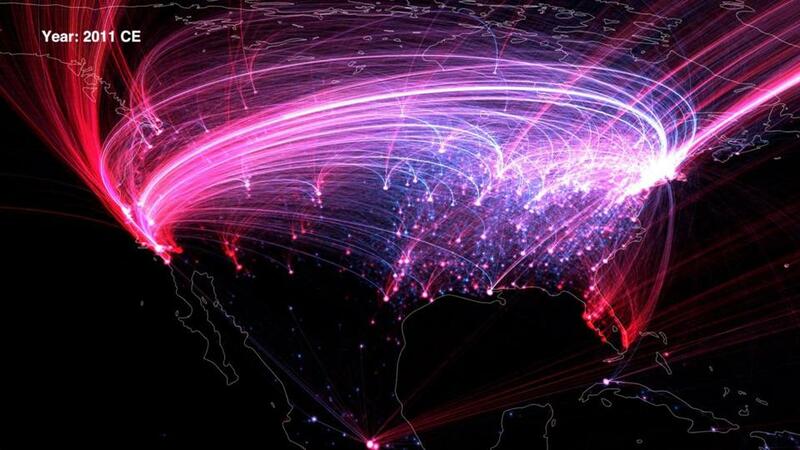 What the physicists found was that despite the advent of the discovery of America and the invention of different modes of travel, human migration patterns did not change dramatically through the ages. Over eight centuries, they found, the average distance between a person’s birth and death place increased, but did not even double -- from 133 miles from cradle to grave in the 1300s to 237 miles in the 21st century. They also found patterns that suggested the ebb and flow of cultural capitols. Although Paris and New York have been death attractors for a long time, for example, there are fluctuations that raise questions. New York, for example, went through a period in the 20s and 30s where it tended to be a birthplace for notable people more than it was a place for Last Rites. There are also small towns, around the Alps, for example, or the French Riviera, that attract deaths even though they are neither large cities, nor cultural hot spots. The data revealed the rise of Rome and the subsequent growth of regional clusters in other parts of Europe. “Collectively, putting these pieces of data together, we get a big picture of all the history of humanity as we know it today,” Barabási said. Erez Lieberman Aiden, a professor of genetics at Baylor College of Medicine, who was not involved in the work, said that what he appreciated about the new study was the way it incorporated geography. Attempts to use quantitative tools to understand the humanities have often mined text to find patterns in words or phrases, or looked at change over time, because dates are a fairly straightforward type of data to use. “I view this paper as doing the important work of figuring out, methodologically, how one can look at cultural changes not only across time, but across space,” Aiden said. Geographical information can be harder to digitize, Aiden said, but especially prior to the Internet it was a key factor in understanding how people influence one another and how ideas spread.